This photo was sent to me by Richard Mercer after he had seen the posting of the London Transport Daimler D1 which also had a Duple body, but as Richard points out this one is more rounded with softer edges and not so angular as the LT one. As there is only one year between this vehicle and the LT one it leads to the question was this bus rebodied before this shot was taken, and if it was, is it possible that it was done by East Lancs. What I like about it is the very shapely cab door, side window and windscreen the driver had good visibility from that cab. Richard has fond memories of this bus which was photographed in St Pauls Road Widnes as it was his school bus in the 1950,s. The bus was withdrawn in 1967 and went to a dealer in Wombwell South Yorkshire I do not know if it had a life after that, if you know, let me know. The asymmetrical upper deck window arrangement was not as may be thought a simple repair job but the standard adopted by Widnes for all its new double deck deliveries until the switch to saloons in the nineteen sixties. This looks like an East Lancs body to me, and this is borne out by another picture of this bus on the Omnicolour Bussslides website. East Lancs apparently managed to convince the authorities that it could not adopt the severe austerity style of construction specified for the standard Utility bodywork without disrupting production, and its wartime bodies were built to the usual East Lancs appearance, though one imagines that the general embargo on the use of lightweight alloys and other materials must have applied. It is possible, therefore, that the body shown is original. However, the neat, well proportioned lines of the body on this Widnes bus certainly looks like an East Lancs product of the 1950s to me. I am no expert on these matters but it definitely looks like a rebody to me. The radius corner flush mounted side windows and sliding ventilators don’t look like those from a utility body and the front and rear domes are too rounded. It does have an East Lancs look about it though. 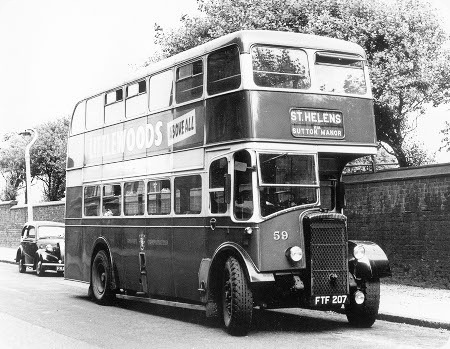 FTF 207 was indeed rebodied by E/Lancs with this lowbridge body in 1955. Several Daimlers from the same batch and and also the 1943 batch received E/Lancs highbridge bodies around the same period. My information is taken from the 1965 edition of Ian Allan British Bus Fleets book 6, Lancashire Municipal fleets. Yes indeed. BBF6 has this as rebodied by East Lancs in 1955. However, it is shown as L55R rather than H55R, with FTF 208 rebodied at the same time as H60R. As a stranger to the area and the operator I can’t possibly comment on the accuracy of the fleet lists, but unless its an optical illusion it certainly looks like a highbridge body. It is an extremely handsome vehicle – however tall it is !! If you look at the handrail running alongside the upperdeck off side windows this confirms that it is a sunken gangway lowbridge body and the roofline is much flatter than the highbridge version. There is a shot of a Leigh Regent here and a Huddersfield one here. I’ve just had a look at the photo of the Leigh one and whilst it is of the same general style as the Widnes/Huddersfield bodies I have noticed that the windows are not as flush as in the newer bodies and the radius corners of the pillars are slightly more angular. So the Leigh bodies are to the earlier design of about 1951. Again, Huddersfield had a batch each of highbridge and lowbridge bodies to this design delivered in 1951/2 the highbridges being 170-5 (FVH 170-5) of 1951 and the lowbridges 226-31 (GCX 26-31) of 1952. The also had a batch of highbridges delivered in 1950, 163-9 (EVH 563-9) but these bodies were of a totally different style altogether. So perhaps this shows that East Lancs were "on the ball" when it came to body design and updating. Another good way of telling that it’s lowbridge is the gutter moulding above the lower saloon. This dips down behind the cab and then up again at the rear bulkhead and is in line with the floor. The drainage from the upper saloon floor would be behind that moulding. I found this very confusing at first. I’ve never seen a picture of this before and I was initially unable to decide between Duple or East Lancs but it clearly is the latter as has now been proven. I think the confusion can be explained through the links posted by Peter W, this vehicle is obviously 7ft 6in wide, which gives the impression of extra height although it is lowbridge and dissembles the East Lancs look to a degree. The Leigh and Huddersfield vehicles are clearly 8ft wide and look more as you expect East Lancs to look for the period. How nice to read that it achieved 22 years service! Perhaps the missing push out ventilator on the off side upperdeck front window makes some people question if it is an East Lancs body and I think it does detracts slightly from what is an otherwise classic design of the period. Just dug out my very well thumbed BBF No 6 Lancashire – dated 1960 (Price 3/6d) and 59 was definitely East Lancs L57R rebodied in 1955 on the original CWA6 utility chassis. Some of this batch were CWD6 and some retained their utility bodies and were never rebodied at all. I remember seeing a utility bodied example in St Helens in the early 1960’s probably 1961/2 from memory. So 59 was the only lowbridge East Lancs rebody. I have them all underlined as being ‘copped’ apart from 54 which I have crossed out so it must have been an early withdrawal. I agree that the single front ventilator which was a Widnes trait made the buses look a bit ‘botched’ and detracted from what otherwise was a tidy fleet. I presume the logic was that passengers wanting the fresh air treatment could choose to sit on the nearside while those of a less robust disposition could take to offside! I remember a spotting trip to Widnes in 1962 when I copped these buses and at that time the new Widnes-Runcorn bridge had not long been open. We took a walk over it and the old Transporter Bridge was in the process of being dismantled. I regret that I never saw it in operation. It was only after the opening of the new bridge that Widnes buses ventured over to Runcorn and previously terminated on the Lancashire side of the river to allow passengers for Runcorn to alight and go as foot passengers on the Transporter. The bus drop-off point and the old Transporter Power Building is still in place at the end of a side street of terraced houses. The rest was all demolished. 58 and 59 were the only two in the fleet with the side gangway upstairs (handrail visible on 59), the seats being four in line on the nearside. 58 was a more decrepit unit so was probably in original form? My grandmother would never travel on upper decks as smoking was allowed, hence the ventilators. Downstairs she would try to avoid the offside seats on these two as headroom was restricted because of the sunken gangway upstairs. I witnessed many a cracked skull.